Your Captain Bruno has a vast experience in yachting. 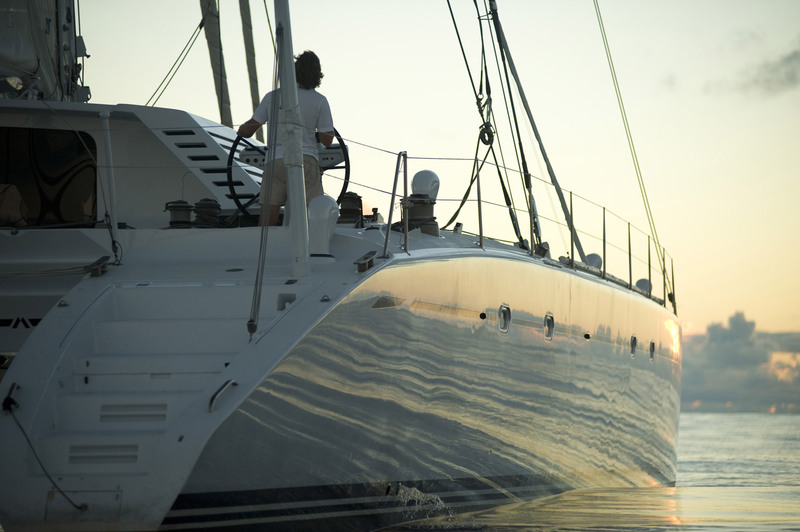 Over the years he has accumulated a wealth of knowledge and professional qualifications having sailed on both private and charter yachts in the Mediterranean, Caribbean and Pacific seas, as well as having crossed both the Atlantic and Pacific seas numerous times. Apart from the professional sailing, Bruno also enjoys pleasure boating, having participated in several regattas. Bruno’s professional knowledge coupled with his pleasant personality and great sense of humour will ensure your cruise will be exciting till the very end. Your trained chef Suzu’s culinary wizardry in the galley and her expert knowledge of drinks will leave you wondering from where she gathered her skills. The answer is: a little bit from everywhere! Suzu originates from the exotic Finnish Lapland, but her work and travels have taken her to many places, including England, France, the Middle East, the Persian Gulf, the Mediterranean, the Caribbean and the Pacific. Suzu has absorbed influences into her cuisine from all of these places and even beyond. Whatever your taste is, Suzu can surely tickle it! Suzu’s professional aptitude combined with her cheerful and entertaining personality will leave you with lasting memories of your cruise, and sometimes even with some recipes and cooking advice!